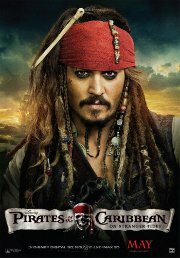 Everyone's favourite pirate Captain Jack Sparrow is back in another action-packed adventure. Crossing paths with the enigmatic Angelica, he's not sure if it's love, or if she's a ruthless con artist who's using him to find the fabled Fountain of Youth. When she forces him aboard the ship of the legendary pirate Blackbeard, Jack finds himself on an unexpected adventure in which he doesn't know whom to fear more: Blackbeard or Angelica, with whom he shares a mysterious past. This film is releasing in both 2D and 3D, this is the 3D version. Looks like a nice place for a dip.